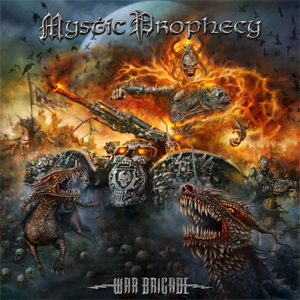 MYSTIC PROPHECY's ninth studio album, War Brigade, was released last Friday, March 18th, via Massacre Records. The band have now released a music video for the track “The Crucifix”, and you can check it out now on KNAC.COM right HERE. The band around frontman and producer R.D. Liapakis finished the album recordings at the Music Factory & Prophecy Studio. R.D. Liapakis and Fredrik Nordström added finishing touches to the album at the Studio Fredman (IN FLAMES, SABATON, ARCH ENEMY). The cover artwork was created by Uwe Jarling, who is also responsible for the artwork for KillHammer, the German’s last album.